"They've enlisted the unique talents of the Piaggio MP3 scooter, an automatic twist n' go 500cc machine, because it's as stable as a car, leans into the curves like a sports bike, has a top speed of 92 mph and sips fuel at the rate of 53 to 55 mpg." These 70 y.o. adventurers challenged the notion that chronological age and the freedom and fun of riding are mutually exclusive. If they could traverse the country, I certainly could ride around Pennsylvania! Time to do some research. Where could I see one of these cool machines? 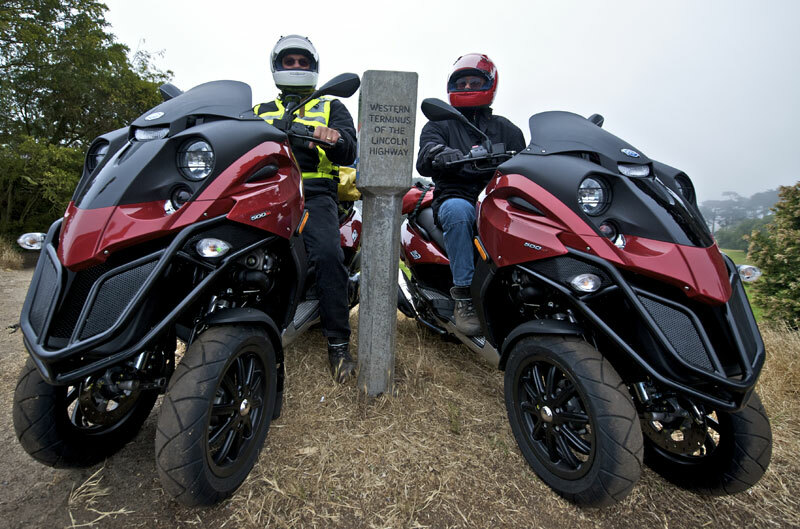 Learn more about the Piaggio Lincoln Highway Ride. Yeah, I also dreams to ride on such bikes as they are very much amazing with full of advance technologies but this time I am looking for some of the maxi scooter as they are best for youngsters with comfortable riding.